A luncheon will follow in the church hall. Burial will then taken place at Yorkville Cemetery with military honors rendered by the Otsego VFW Post 3030. Remarkably successful, Jack Lawrence modeled a lifetime of hard work and commitment to the community he loved. A generous and loving husband, father, and grandfather, he treasured the time he spent with his family building memories over the years. Nothing brought him greater joy than being around people. His warm spirit and quick-wit will be dearly missed and fondly remembered by his many special friends and loved ones for generations to come. The 1920s saw large-scale industrial growth and significant changes in our nation’s culture. At a time when Lou Gehrig and Amelia Earhart were household names, William and Borgia Lawrence welcomed home their newborn son, John “Jack” Warren, on March 25, 1928, in Kalamazoo, Michigan. His brought great hope and promise to his parents during an exciting time in our nation’s history. Jack was born with a natural love of water. He enjoyed any type of boat, lake, or beach from a young age. He masterfully learned the art of crewing a sailboat from his father. They made many special memories enjoying the craft before his father suffered a heart attack when Jack was the tender age of thirteen years old. From then on, he took on more responsibilities around the house, but always made time for the water. 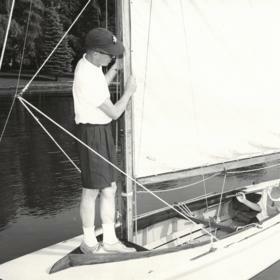 By the time he was fifteen, he was a member of the Gull Lake Yacht Club and started racing. Graduating with the Class of 1945 from St. Augustine High School, Jack continued his education at Western Michigan University earning his Bachelors of Science in 1949. Ambitious and driven, he also obtained his Masters in Business from the University of Michigan in 1950. With a strong desire to serve his country, Jack left for the U.S. Navy Officer Candidate School in Newport, Rhode Island. After graduating, he spent 1952-1955 aboard USS RAYMOND, DE 341 as an Operations and CIC Officer. After he was discharged, the course of his life would forever be changed by the meeting of the woman of his dreams, Joanne! 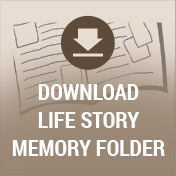 She was a dental hygienist with a degree from U of M, and Jack was one of her first patients. Despite the bright overhead lamp, he could not take his eyes off of her throughout the exam! Their first date was to a Wolverine football game and the rest was history! Engaged on Valentine’s Day of 1956, the happy couple were eager to spend the rest of their lives together. St. 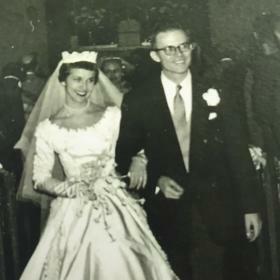 Basil Church in South Haven was the perfect setting for their wedding on October 27, 1956. Returning home from their honeymoon cruise, Jack got right to work on the blueprints for their forever family home in Richland on Gull Lake. Together they raised four wonderful children. As parents, they maintained the same level of reverence for their faith then they did during their own growing years. They never missed Sunday mass even if they were on vacation. Many of their weekends on the water were where they built their greatest memories. Whether they were sailboat racing, enjoying the fireworks on the Fourth of July, or gathered around a wonderful picnic, Gull Lake was the center of the lives together. Jack also instilled in his children the essence of being genuine with each and every person they met in their lifetime. 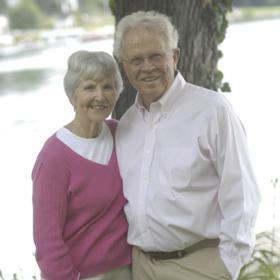 He modeled a strong work ethic, being a risk-taker, the importance of serving others, as well as a deep and romantic love for his wife, Joanne. Jack wanted nothing more than the very best for his family. As busy as he became with balancing work and his many commitments with various organizations, he never missed a meal with his family! Dinner was their sacred time together and he loved to share in their daily journeys and encourage them to follow their passions in life without regret. He was indeed, their “true North,” as he shared his moral compass with them over their developing years. A steadfast provider, Jack built and owned many businesses. He was CEO of Illinois Envelope from 1958 to 1985. He was a co-founder of Channel 41 Inc. (WOTV) of Battle Creek, Michigan and served as its Chairman from 1972 to 2002.  He was also the founder and Chairman of Lawrence Productions based in Galesburg and Grand Rapids, Michigan. One of Jack’s favorite business endeavors was serving in an active management role with Superior Pine Products Company, a business co-founded by his father, serving as its Secretary-Treasurer from 1967 to 1993 and then its Chairman until 2005. Always one to keep up with the changing economy and have a pulse on the market, Jack also served on the Boards of Directors of American National Bank, Old Kent Bank – Southwest, and Fidelity Federal Savings & Loan. In addition to being a wonderful father, grandfather, and businessman, Jack loved serving his community through many volunteer and philanthropic efforts. Jack served on the Boards of Directors/Trustees of Borgess Medical Center and related organizations (Chair), United Way of Greater Kalamazoo (Vice Chair), United Way of Michigan, Starr Commonwealth Schools, Western Michigan University Foundation, Nazareth College (Chair), Barbour Hall Foundation, Catholic Social Services, Constance Brown Hearing and Speech Center, Kalamazoo Chamber of Commerce, Kiwanis Club, Gull Lake Community Schools Foundation, and the Gull Lake Country Club. 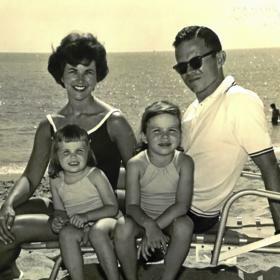 Even during their many winters in Sanibel Island and later Naples, Jack and Joanne made a significant impact in the communities they called home. 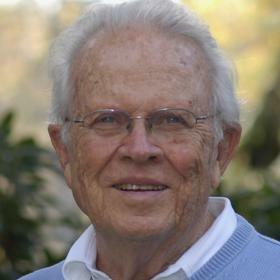 Although he never did any of it for the recognition, Jack received a Citizen Leadership Award from the Greater Michigan Foundation in 1993; a Kiwanis Club Volunteer Award in 1986; an Honorary Degree of Doctor of Humane Letters from Nazareth College in 1990; and the Starr Lifetime Achievement Award for Volunteer Activities in 2003. Generous beyond measure, Jack leaves behind a rich legacy of living life to the fullest. May his loved ones embrace the true honor of knowing and loving such a man of his caliber and grace. John (“Jack”) Warren Lawrence, 90, died peacefully on Sunday, February 3, 2019, surrounded by his loving family. He was an active parishioner at St. Ann Catholic Church in Richland, Michigan as well as St. John the Evangelist Church in Naples, Florida. Jack leaves his wife of sixty-two years, Joanne (McDonald) Lawrence; his daughters, Joni (Tim) Knapper and Jane (Joe) Brogger; and his sons, John (Kelly) Lawrence Jr. and Jeff (Amanda) Lawrence, brother-in-law, Dr. Richard (Bev) McDonald, eleven grandchildren; Stephanie (David) Adams, Betsy Knapper, Sara Knapper, John (Kacie) Brogger, Bill Brogger, Jennifer Brogger, Molly Lawrence, Rob Lawrence, Abby Lawrence, Jack Lawrence, and Will Lawrence, three great-grandchildren; Emma, Nora, and Leia Adams, and several special nieces and nephews. Jack was preceded in death by his parents and brother, William (Dori) Lawrence, Jr. Visit with family and friends while sharing food and drinks on Wednesday (Feb. 6) from 4 PM – 7 PM at Betzler Funeral Home, 6080 Stadium Drive, Kalamazoo (269) 375-2900. Mass of Christian Burial will be celebrated Thursday 10 AM at St. Ann Catholic Church, 12648 E D Avenue, Augusta. A luncheon will follow the mass in the church hall. Memorial donations may be made to the Borgess Foundation, Senior Services of Southwest Michigan, or the Congregation of the Sisters of St. Joseph (Nazareth).